Sons, who as children witnessed domestic violence, are ten times more likely to abuse their spouses when adults (4). This terrifying statistic represents the sad reality here in Canada. As child abuse is normally seen as physical/sexual abuse and neglect, most people are unaware of the severe consequences witnessing family abuse has on developing children. Children who witness family violence suffer similar consequences as those who are directly abused (6). Even though most parents believe they hide their abusive behaviours an American study by Fusco and Fantuza show children are eye witnesses to approximately 85-90% of family violence in their home (1). Even if the event is not completely witnessed by the child, the after effects of physical or psychological damage to the victim can have the serious consequence on the child (2). Witnessing these acts of violence has both immediate and long-term consequences that effect victims in both emotionally and physically. Early exposure (infancy-age 4) can result in poor immune functioning and can lead to poor physical health and defense against disease (1). An American study conducted in 2005 by Graham Bermann and Seng shows that preschool aged children who experience violence in their home were 4 times more likely to have asthma, allergies and gastrointestinal problems (1) They are also more likely to experience early depression and post traumatic stress (7). When the children reach school age (5-10) those who had experienced family violence in their home had more than twice the amount of aggression compared to those who did not, as well as double the odds of high anxiety (3). As children reach the years of young adulthood, the effects of family violence become much more pronounced and the symptoms begin to differ between sexes. Boys from violent homes are described as frequently displaying externalizing behaviour problems, such as rude defiance or using aggression to solve their problems, as well as experiencing lower social competence. Whereas girls are described as internalizing their behaviour problems, and so show overall fewer adjustment problems than boys (4). Girls are also more likely to participate in self-injurious behaviour (3). In the Canadian study by Wolfe, Jaffe, Wilson and Zak, it was discovered that more than a quarter of children affected reported having problems of such severity that they were considered clinical (4). When children who experienced family abuse begin to have their own families, the effects continue on into adulthood. Physical problems still continue to appear as adult survivors experience more frequent headaches, migraines, muscle pain, sinus pain, and gastrointestinal problems(1). The emotional effects are lasting as well, almost every son who witnessed domestic abuse as a child, will abuse his wife or partner at some point during his relationship(4). As well, a daughter who witnessed family abuse in her developmental years will be less likely to seek refuge from her husband’s beating if it does occur (4) Sadly, these lasting effects cause this terrible situation to become a continuous painful cycle. In 2011,police in Canada reported 95,000 victims of family violence (5), and, out of fear, farm more cases go unreported. With all these victims we must consider not only their physical harm and abuse, but also the lasting abuse they are causing for the young children who witness these horrendous acts. If you suspect children you know to have witnessed violence within their household, encourage them to reach out and speak to you, take note of exactly what they are saying, and then contact your local police or child service agency. It is only through treatment to those affected that we here in Canada can change the cycle of violence. (1)Kuhtman,Kate.,Howell,Kathryn.,Bermann,Sandra. “Physical Heath in Preschool Children exposed to Intimate Partner Violence”Journal of family Violence.27.6. (2012):499-510.web.March 21,2014. (2)Rhodes,Kann.,Cerulli,Catherine.,Ditcher,Melissa.,Kathati,Catherine.,Barg,Frances. “I didn’t want to put them through that : The influence of children on victim decision making in intimate partner violence cases” J Fam Viol.25(2010):485-493.Web.March 21,2014. (3)Moss,Kathleen. 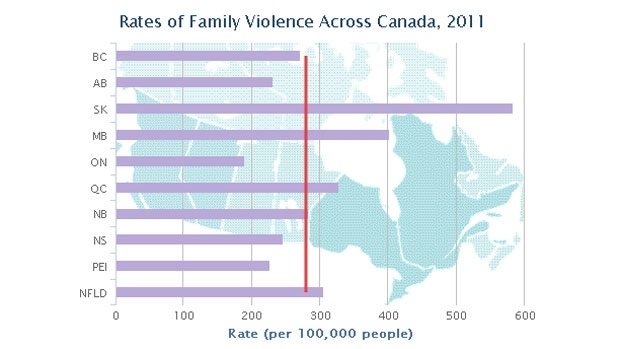 “Kids witnessing family violence”Canadian Social Trend. (2004):12-16.Web.March 21,2014. (4)Wolfe,David.,Jaffe,Peter.,Wilson,Susan.,Zac,Lydia. “ Children of battered women: the relation of child behaviour to family violence and maternal stress”Journal of consulting and clinical psychology.53.5(1985):657-665.Web.March 21 2014.